This was one of my first rebuilds. My friends, Glen Berry, Lew Mayor, Mark Gawel, Dwight Gill and Rob Meadows started riding ARHMA trials around 2001. They tried to get me involved for a course of years and I finally caved! 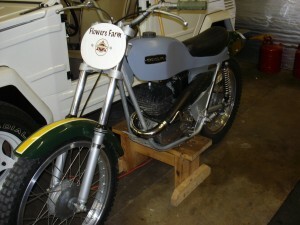 Larry Flowers was another guy they were trying to recruit – and I knew he had the old 4-speed Plonker – in many pieces. Larry and I made a deal for me to do the rebuild, him to finance the parts and materials. Both of us were going to ride some events! I picked up the project in the back of a minivan – again, many pieces. 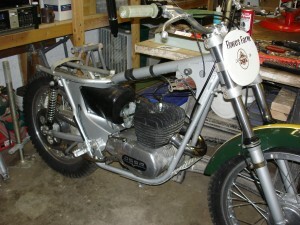 With the help of Rob Meadows, we got the engine built and I put the chassis together. OSSA modified an Enduro bike to offer this trials model – lighter front hub, low fender, decreased rake, foot pegs set back and trials tires. It is a bit heavy – 230 lbs. – but handled pretty well. I rode several trials, mid-Ohio and local MAVT events. Larry was unable to make time to ride – I eventually bought it from him.